Bitcoin Robot is one of the oldest-running bitcoin auto-trading scams out there. The BTCRobot.com domain was created back in 2013. The funny fact about it is that the people pushing it and those profiting from it through affiliate sales, still stand behind it and attempt to clumsily defend it on various forums where the community has long cast judgment regarding the “capabilities” of the “platform.” It must be the unregulated nature of the bitcoin industry that has kept these scammers going for this long. What exactly is BTC Robot though? Or rather: what exactly is it selling itself as? 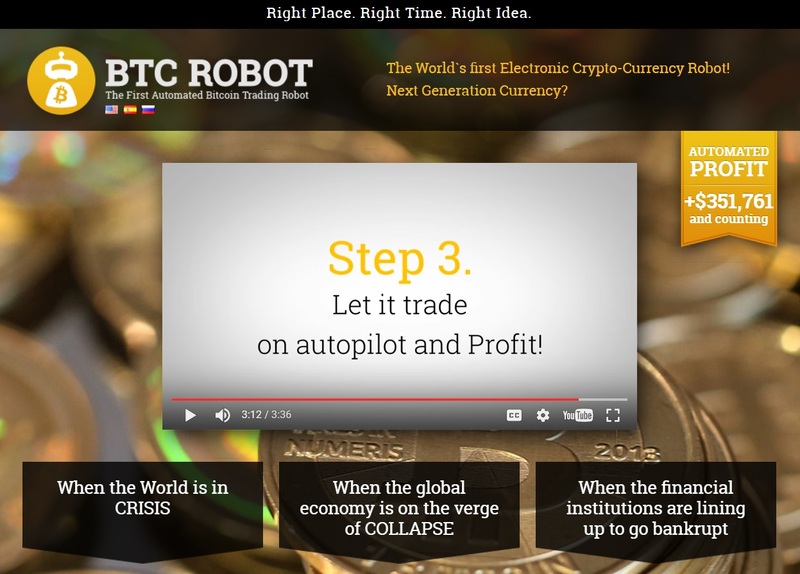 It is apparently a Bitcoin trading robot, which buys and sells the world’s most popular virtual currency in several tens of small daily trades, and it allegedly manages to turn a profit from this activity, by taking advantage of “human greed.” According to a video which is sort of meant to explain how BTC Robot works, the system sells high and buys low all the time, taking advantage of the small value fluctuations, even as the long-term asset-price trend is a strongly bullish one. No technical details are provided on how the auto-trader achieves its positively “too-good-to-be-true” results, but that’s hardly surprising. Apparently, the “trader” makes some random trades, and unmistakably, it ends up chewing up and swallowing the bitcoins of its gullible victims. BTC Robot was set up by a team of Russian programmers, and if that doesn’t scream “trustworthy” a mile away, the website and the cheap sales copy delivered on the homepage definitely will. Such scams are dime-a-dozen in the binary option and trading world. They’re just now moving over to the bitcoin scene, taking advantage of the fact that no one monitors such activity there and that the community isn’t quite as wise to such attempts yet. As far as exposing the scam though various forums and even YouTube, the community has indeed done its part. There are countless complaints out there and that isn’t the least bit surprising either, given the ridiculously transparent scam model we’re dealing with here. First of all: the main sales pitch made on the btcrobot.com homepage is ridiculously sophomoric and quite the laugh for everyone even a tiny bit versed in trading and crypto currencies. It is nothing but a blatant attempt to ride the hype surrounding bitcoin and the fact that it’s the “currency of the future.” That angle takes up about 99% of the homepage copy, leaving little to no room to actual details regarding HOW the ill-famed robot-trader does its magic. The reason is – you’ve guessed it – that the only magic performed here concerns the disappearance of your bitcoins at the hands of these “reputable” scammers. The bits and crumbs of information provided on the actual inner workings of the software are few, far between, and quite ridiculous. The first video goes through extra trouble to prove how profitable the trading robot is. The result is a something we’ve seen attempted countless times by various binary option and Forex scammers. The MO of BTC Robot seems to be to show users their balances in USD only. That way, even as they slowly chip away at the bitcoin balances of their users, they can fool people into thinking they are logging USD profits. They have people going around various forums, looking to counter the complaints of those scammed through pseudo math, often stating that the purpose of the robot is to manage one’s account in USDs. They obviously simply glide over the fact that in BTCs, its losses are always considerable. The trades the robot takes, all seem to come at inappropriate times, and everything about the way it works points to a major fleecing scheme, one that is extremely difficult to properly track because of the nature of bitcoin and the bitcoin scene. Does it surprise anyone that the comment section under the above said “proof” video has been disabled on YouTube? His picture – as those of the rest of the BTC Robot “team” – may indeed have been taken by the scammers themselves, as they aren’t stock photos for the most part. Of course, they may also have simply been lifted off some low-profile, and now-defunct Russian sites. “Creator” #4 for instance used to manage a football site, as Eugene S. Romanov. The only female member of the team, Anna, used to be featured at a cam-date website, as “kimiu383”. Not much of this has any current traces though. Given the age of the scam, much of this telltale proof has fallen victim to natural online decay/attrition. The site itself used to be hosted on the same server with a number of forex and binary option-based get-rich-quick operations. These days, it has its own dedicated IP though. Our research indicates that the BTC Robot fraud is mainly targeting people in USA, India, Indonesia as well as other countries. Verdit: BTC Robot is a SCAM! If you have been scammed by this Bitcoin Robot, please tell your story in a comment below. You’re also welcome to contact us if you would like to consult with us about your bitcoin investment strategy. We may also be able to help you recover lost funds in case you have been scammed. Good article! I believe that if you set up the bot correctly, then you can earn money. Of course, it shouldn’t be the main source of income, but to trade for fun it’s ok .. Recently I set up Trade Santa bot, and so far it turned out to raise $ 30 per week .. how do you trade? What are your minimum amounts? Is coinsrobot.com a scam ? And that is based on? No real contact/company information. Too good to be true returns. And we’re already quite proficient in recognizing a scam.